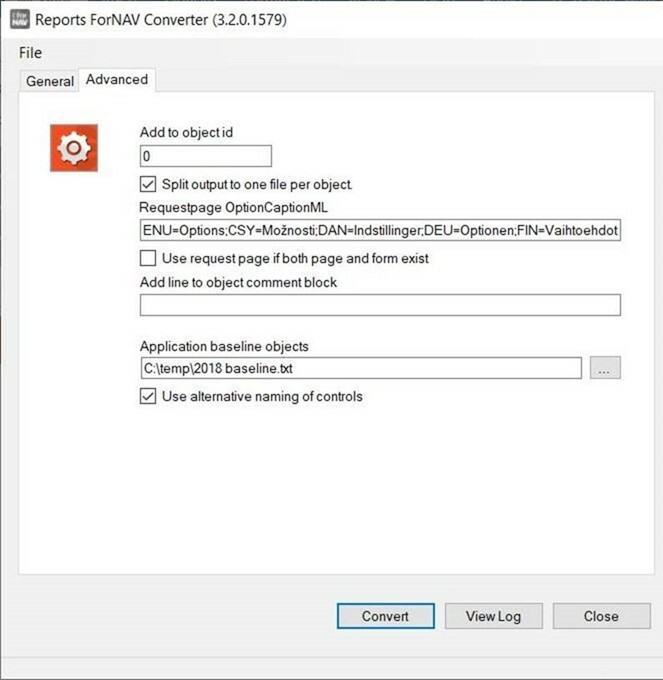 The new version of the ForNAV Converter now supports conversion of any C/SIDE object to an AL extension, and you can even keep your reports in RDLC format if you are not ready to migrate to ForNAV reports yet. This means that the ForNAV Converter offers you the added value of being a free, single-step tool to move from C/SIDE to Visual Studio Code development. Normally, Microsoft prescribes that an application needs to be upgraded to Business Central before the conversion can be done. However, the downside of this is that everything needs to be compiled on Business Central before the conversion to AL. Because the C/SIDE compiler only reports one error at a time; it can be very hard to predict when an upgrade will be completed. With the ForNAV Converter, this issue has been simplified into a one-step process where the cleanup is done in Visual Studio Code after the conversion. Working with Visual Studio Code is a huge benefit compared to C/SIDE because you get much better tools to do cross-object fixing of code, and a lot of bugs in the original code are highlighted. This is especially common in CalcFormulas where the expression is only validated in C/SIDE if it is changed and in normal installations there will be a lot of CalcFormulas with references to fields that do not exist anymore. Built-in creation of table and page extensions derived from a txt baseline application. The txt does not have to be imported and compiled on Business Central before the conversion. This means that cleanup can be done in Visual Studio Code in a more efficient way than doing it in C/SIDE. Creation of meaningful names for UI elements that do not have a name property. Dotnet references that also exist in the base app are included – but commented out. Keys on table extensions are commented out because they are not supported in Business Central. UsageCategorys are defined based on Menusuites. The Application Area is set to basic if not defined on a UI element. Codeunit delta files are converted to an .al skeleton. Codeunit 1 events are mapped automatically. You do not need a ForNAV license to convert from txt to AL with the ForNAV Converter; it is free to use. In the Tabledefinition file name, web service or app file field, enter the path to the Visual Studio Code app files with the *.app file filter. In the Input file field, enter the path to the input txt file or use wildcards to select more txt files. In the NAV Compatibility field, click Business Central Cloud (AL-extension). 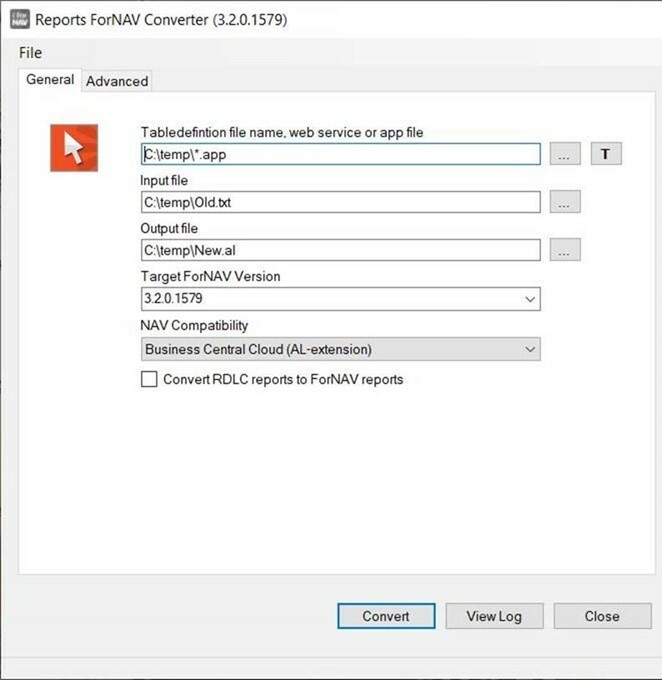 To convert your reports to ForNAV, select the Convert RDLC reports to ForNAV reports check box. Leave this check box blank if you want to keep the reports as RDLC. Processing-only reports are not converted to ForNAV reports. To generate a file per object, select the Split output to one file per object check box. This is recommended to get a better overview in the source code when working in Visual Studio Code. In the Application baseline objects field, you can enter a txt baseline app. This results in the creation of delta files for pages and tables. Select the Use alternative naming of control check box to create more readable names for UI elements, where a name has not been defined. This is recommended because standard Microsoft naming is based on Source expression and CaptionML, which can be incomprehensive to use as names. In our solution we added some option fields to, for example, the sales line. How does the NAV converter converts these added option fields? What’s the download link to download the tool? Conversion tool seems to be working, thanks a lot! Could you describe what the “Add to Object Id” field is for? I filled in 10000 expecting it to add 10000 to the new Objects and Fields Id’s but it doesn’t seem to do anything. Would also be great if you could add a Prefix or Suffix to the advanced options so that the conversion automatically adds it to the Object Names and Fields from a Table Extension. The AL Converter is a great tool and it helps us to convert customer specific customizations already. What we like especially is the ability to build from normal .txt exports. Even MS depreciated already converting CaptionML properties 1:1 and creating xlf files instead, for on prem customer customizations we still hesitate to use .xlf for captions and still stick with the CaptionML property. Therefore, a switch in the converter that keeps the CaptionML property in the .al code would add great value for us. We are using the BC txt2al.exe to do part of the conversions and since MS has removed the option to keep CaptionML when converting it always outputs xlf + MS does not support converting ML’s to xlf files which means that you will have a problem when ML’s are depreciated. it looks like the ObjectIdDelta doesn’t work in Conversion tool version: 4.0.0.1596. Thanks for trying out the tool! the tool works very good and reduces necessary steps to a Minimum! Great. Error loading application object from file: C:\_MI13-Txt2Al\MI13_20190306_Filter_MI_VG_txtExport.txt Message: StartIndex darf nicht kleiner als Null sein. In this Page we just added another factbox, nothing else. Error extracting application object from file: C:\_MI13-Txt2Al\MI13_20190306_Filter_MI_VG_txtExport.txt Message: Error converting file: Die Länge darf nicht kleiner als 0 (null) sein. Here we assume the global standard var “StyleText” could be the Problem because this var is text without a length. Could you give a hint why this error occurs? Both problems don’t occure using the “Standard txt2Al” way! Here the pages are converted without problems. Hi Michael, which txt file do you mean? The Error Log or the CSide-Text Export?